Let your wild side spice up your coyote hunting. It could increase your fur count significantly. He’s not really going to use that call, is he? That thought raced through my mind as my coyote-hunting partner for the day, a friend of a friend connection, started blowing on a kazoo-style call adorned with more rubber bands than a Staples office supply store. I turned away not only from the frightful sound, but to avoid being zapped in the eye by a rogue rubber band. My calling partner’s wild side was definitely showing. Five minutes had barely passed when I jumped at the crack of his rifle. A coyote was laying just yards away from his feet. I had to admit I never believed the wild, offbeat call would produce fur, but the evidence was leaving a blood trail as we dragged it back to the truck. Maybe embracing the wild side was the answer to increasing my random success. That hunt took place in my early years of coyote hunting, and it proved that odd sound works. Today, more than ever, predators are receiving increased pressure from hunters’ intent on hunting the entire calendar year. The hunting industry has embraced this predator trend with new firearms, tailored ammunition, specific gear and specialized clothing. That’s good, but with the good always comes some bad. The bad is that coyotes have become increasingly more difficult to call into shooting range. More hunters means more botched setups. Today’s coyotes have a Sasquatch diploma in evasiveness teamed with ever-present, coyote paranoia. 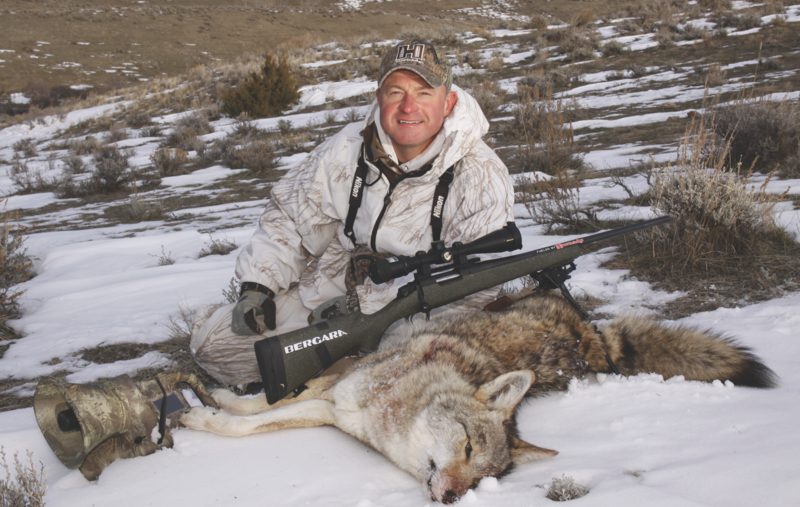 Steve Criner, host of Dog Soldier TV on the Sportsman Channel, understands the challenges of modern coyote hunting as much as anyone. It’s his job to produce quality coyote hunting entertainment and that often can be a test when competing with weekend warriors. Criner started hunting Midwestern coyotes more than two decades ago. Today he travels throughout the country experiencing the good and the bad of coyote behavior. To find success he often embraces his wild side by tossing tradition into the borrow ditch as he moves to his next calling site. Criner knows coyotes feel pressure and danger from humans. This creates a negative association when they sense or realize humans are around. He knows a coyote that has survived a meeting with a hunter utilizing predator calls stands a far greater chance of avoiding the same sound that was blaring right before the blast. That’s the main reason Criner isn’t afraid to try sounds that the average predator hunter may not consider. It comes from his personal understanding of coyote mentality. If you’ve done your scouting and know you’re calling in the zip code of a healthy coyote population, you should experience some success. If coyotes are giving you the cold shoulder then you may need to bring out your wild side when it comes to coyote-attracting sounds. Birds are an everyday element in coyote habitat from coast to coast. As opportunists, coyotes dine on birds and bird eggs. The shrill sounds of a bird in peril or the squawks of a gamebird in dire straits could be your wild-side ticket to calling in a coyote. Don’t overlook sounds from starlings, woodpeckers, wood ducks, robins and even pheasants in distress. Coyotes also utilize birds as indicators of food opportunities, such as following scavenger birds or moving to the sounds of a commotion. Think of jays, ravens, magpies and crows. Criner knows there is a deep relationship between coyotes and crows. Crows scavenge leftovers from coyote kills and even follow coyotes to other scavenging opportunities. Coyotes, on the other hand, follow the sounds of gathering crows to find food and key in on the alarm sounds of crows detecting danger. Crows are an easy birdcall to master and come imbedded in the library of many electronic callers. Practice, use crow decoys and call in a flock. Real crows or your calls could be the easy ticket to luring in a wily coyote. Coyotes live in all corners of America. Many have successfully taken up residency in rural outskirts, suburbs and even downtown habitats. That means they focus their attention on domestic animals, livestock and pets. Criner isn’t opposed to serving up the sounds of home and farm when he discovers coyotes avoiding mainstay calls. One caller I know from Wyoming even trained a goat to go along with him. It was a two-for-one coyote attractor. When staked and left alone the goat would begin to bleat for companionship. That sound and the sight of the goat was enough to make several coyotes stand perfectly for a Hornady hammering. You’ve certainly watched “America’s Funniest Home Videos.” Pay attention to their segment “Name That Sound.” Not only will it bring a smile to your face, but it also will open your eyes to new and different sounds no call manufacturer has even thought of to lure in a crafty coyote. Scratchy, crying, shrieking and squeaky sounds highlight the entertainment segment and may get your creative juices flowing. Coyotes have no aversion coming to sounds that don’t live and breathe in their zip code. Success with piglet in distress sounds from the Northwest Territories to Old Mexico proves that point. One of the more interesting discussions I heard at hunting camp was the use of human baby cries to lure in coyotes. While discussing that oddity with Criner he opened up about recording the wails of his then 3-day-old daughter Zoey. Her recorded sounds called in a triple on the first outing. With the recording capabilities on handheld devices and the ease in transferring new sounds to a call, you can use almost any sound imaginable. Go to your wild side and start imagining. Then turn that vision into coyote success.